Here's the beauty you've been waiting for! 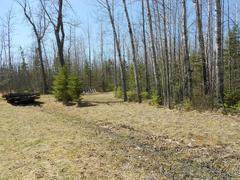 Excellent parcel for sale, tucked back off Highway 11 in Birchdale, Minnesota with over half a mile of privacy you desire. Most of the 24.42 acre/660 ft of waterfront property is wooded with a nice mixture of evergreen, birch, aspen, and cedar trees. An older house moved onto the property serves as a cabin with over 650 square feet of living area on the main level with more room upstairs. Cabin has a practically brand new Cozy heater that normally costs over $1,000 installed. Electricity is reportedly a short distance away to bring in. Property towards the river has some rolling topography and adds to the charm of this piece along with trails by the water, hand-built benches and walking bridges. Owner's father reports seeing a moose last year close to the cabin. Property is close to the Birchdale landing area and Canadian Indian Interpretive Center across the mighty Rainy River. World class sturgeon and walleye fishing is at your front door on this one, not to mention some fine whitetail deer hunting. Come take a look, you don't want this to be "the one that got away"! Call Steve at Northland Woods 'N Water for more information today! 218-202-1135. Reduced to $89,900!